French President elect Emmanuel Macron and his wife Brigitte Trogneux celebrate on the stage at his victory rally near the Louvre in Paris. 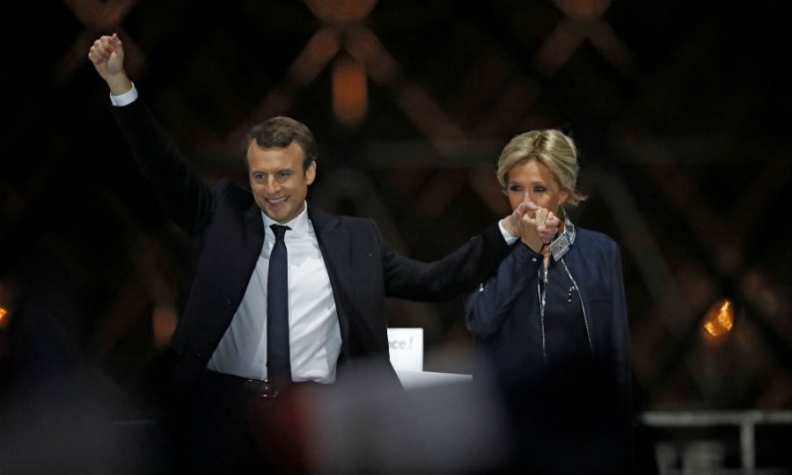 PARIS -- France broke with the populist wave that led to Brexit and Donald Trump's election as U.S. president by choosing pro-European Union centrist Emmanuel Macron as its new leader over anti-EU, anti-immigration far-rightist Marine Le Pen. Macron's election as France's president for the next five years could be good news for domestic automakers Renault and PSA Group if the former investment banker carries through his policies to reduce taxes on employers and give companies more flexibility to hire and fire. His victory also removes the threat of a trade war if Le Pen had followed through on promises to leave the EU and raise tariffs on imports. Germany's VDA industry association welcomed the news and said it was hoping for more intensive cooperation between French and German automakers. "We know from our talks with [Macron] that he understands the challenges facing European industry, especially the automotive industry," VDA President Matthias Wissmann said in a statement. Analysts see the French government as more likely to sell its stakes in Renault and PSA under Macron. "We see any government sale as a positive for Renault, as it removes the barrier to a more efficient and balanced holding with Nissan," Evercore ISI analyst Arndt Ellinghorst said in a note to investors. Exane BNP Paribas said Macron's election greatly reduces political risk in the short term but warned that if he fails to implement his policies, the odds of an anti-EU candidate emerging to become president in the next election could rise significantly. Macron's opponent, Le Pen conceded defeat on Sunday shortly after polls closed at 8 p.m. local time. Projections issued within minutes of polling stations closing showed Macron winning by around 65 percent to 35 percent - a gap wider than the 20 or so percentage points that pre-election surveys had pointed to. Le Pen, 48, said she had congratulated Macron. But she defiantly claimed the mantle of France's main opposition in calling on "all patriots to join us" in constituting a "new political force." During the campaign she had said if elected she would try to force French automakers to bring production back to France, using tariffs and other protectionist measures. In January, she praised President Trump's plan to impose a border tariff on goods made in Mexico, saying he was "putting in place measures that I have been advocating for years." In 2014, she described the appearance of Macron, then economy minister, at the opening of a new Renault plant in Algeria as "indecent" at a time when factory closings were accelerating in France. Macron has said he will seek to strengthen France’s ties to the EU and liberalize the country's strict worker protection regulations, measures analysts say could help Renault and PSA to reduce costs and achieve production efficiencies. Le Pen sought to depict Macron, who left the Socialist Party to lead his own movement called "En Marche," or "On the Move," as unsympathetic to the plight of voters who felt that globalization had left them behind. Macron argued that Le Pen, whose father Jean-Marie Le Pen founded the National Front party and also made it to the second round of presidential voting in 2002, would sow divisions with her anti-immigrant and nationalist rhetoric, and would damagingly isolate the French economy from global trade. The French economy has sputtered for years, with unemployment remaining stubbornly high at about 10 percent, and annual GDP growth -- 1.4 percent last year -- lagging the EU as a whole. As economic minister to outgoing President Francois Hollande, Macron pushed through a package of gradual reforms in 2015 that came to be known as the "Macron law." It came over the fierce objections of labor unions and strong resistance from within Hollande’s Socialist Party, while free-market advocates said it did not go far enough. More options to maximize labor efficiency could immediately benefit PSA, as CEO Carlos Tavares tries to integrate Opel/Vauxhall production with the Peugeot and Citroen brands. "The French have a strong but concentrated industry in some sectors, which so far has not been able to fully exploit its strength," said Daniel Gros, the director of the Center for European Policy Studies, a think tank in Brussels. "The labor laws, the very high tax burden -- these are the two key issues that hold French industry back." Macron took an interventionist position with the French auto industry as a member of the Socialist Holland administration, overseeing an increase in the government’s stake to 20 percent and criticizing the pay of CEO Carlos Ghosn. He was an adviser to Hollande when the government took a 14 percent share in PSA in 2014 as the automaker struggled to find financing to avoid bankruptcy. Macron has proposed selling off some of the French state’s stakes in public companies, reportedly including PSA in which the government has a 13.7 percent stake, to fund innovation initiatives. Sebastien Laye, a research associate at the Thomas More Institute, a think tank in Paris, said it was uncertain whether Macron would follow through. "Yes, he's pro-business, but he has this view, which is very common in France, of the state as some sort of a strategist," Laye said. "That's the last area where French politicians can directly control the economy, and they are not going to let it go. In his case, because he knows these companies really well, he will tempted to intervene." Macron, who at 39 is France's youngest leader since Napoleon, faced a daunting task in winning the presidency as an inexperienced candidate with no real party of his own. However, enacting his program will be just as hard, analysts said. He will first have to assemble a cabinet, then hope for a victory in June's parliamentary elections. "You need a landslide victory, you need to move fast, you need to shock everyone so that the entrepreneurial spirits of the nation are going to be freed," Laye said. "If you do it slowly, year after year, which is what we have been doing, then people will always have a feeling that you always have austerity, that politicians are asking for a lot from the workers, and you don’t see the impact or difference." It will be equally important for Macron to court France's powerful unions, including auto workers, Gros said. "The key thing is that he does it without too much conflict with the trade unions," he said. "If he can do that, it might have a similar effect as in Germany, where after a while the trade unions agreed that more flexibility was needed and collaborated, and that was a big plus for the industry." Macron's immediate challenge will be to secure a majority in next month's parliamentary election for En Marche, his political movement that is barely a year old, in order to implement his program. However, at least one opinion poll published in the run-up to the second round has indicated that this could be within reach.